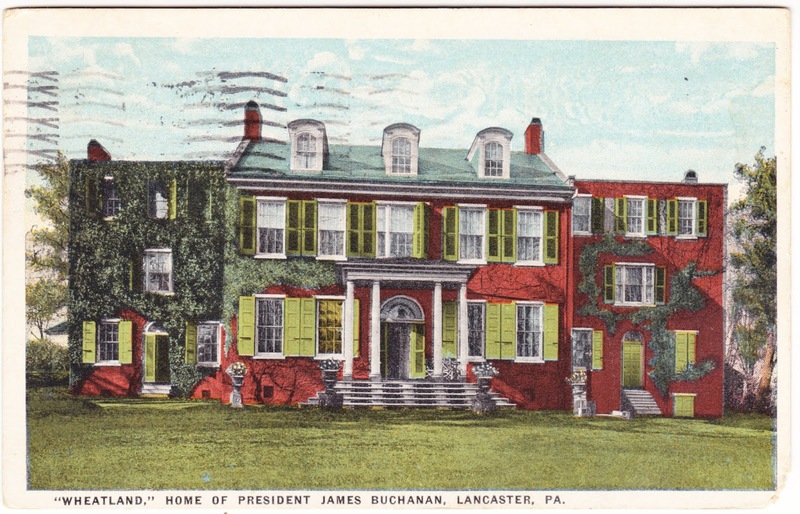 Here's an old postcard featuring Wheatland, the Lancaster, Pennsylvania, home of 15th President of the United States James Buchanan (whose hopes of getting out of the cellar of the all-time rankings of U.S. presidents are on the rise). Although Wheatland is just blocks from my workplace, I haven't visited it yet, though I have been to Buchanan's extremely modest grave at Woodward Hill Cemetery, also in Lancaster, a couple times. D.B.H. Carl had already set folks to getting that stamp but perhaps he can call it off to morrow — Glad you could go to Lowell & get in & do errands — It was a fine day. We went to Coney Island yesterday P.M. It has a fine beach but a perfectly enormous lot of cheap side show stuff & crowds of "onery" people — Keep auto tires 35 to 40.